Can a thoughtful person today seriously believe that God wrote a book? There are an unprecedented number of sophisticated attacks on the origin, credibility, and reliability of the Bible. It can be difficult to know what to say when skepticism and secularism take over so many conversations. Additionally, confusion and doubt about the Bible being God's Word are becoming as common inside the church as they are in the broader culture. The purpose of this book is to respond to these challenges, sound bites, and slogans...and give people confidence that the Bible can be trusted and that it matters for our lives because God really has spoken. Jonathan Morrow (DMin) is the founder of Think Christianly (thinkChristianly.org). He speaks nationally on worldview, apologetics, and culture and is passionate about seeing a new generation understand what they believe, why they believe it and why it matters in life. 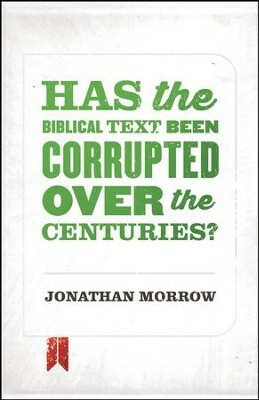 Jonathan is the author of Welcome to College: A Christ-follower's Guide for the Journey, Questioning the Bible: 11 Major Challenges to the Bible's Authority, Think Christianly: Looking at the Intersection of Faith and Culture, and Is God Just a Human Invention? And Seventeen Other Questions Raised by the New Atheists (with Sean McDowell), and contributed the chapter "Introducing Spiritual Formation" to Foundations of Spiritual Formation: A Community Approach to Becoming Like Christ. Jonathan contributed several articles to the Apologetics Study Bible for Students and has written for Leadership Journal Online (of Christianity Today). He graduated with an M.Div. and an M.A. in philosophy of religion and ethics from Talbot School of Theology at Biola University and served as the equipping pastor for 6 years at Fellowship Bible Church in Murfreesboro, TN before completing his Doctor of Ministry degree. Jonathan is currently Director of Creative Strategies and Immersion at Impact 360 Institute (impact360.org) where he teaches worldview, apologetics, and leadership to High School and College students in their summer Immersion and 9-month Gap Year experiences. His books have been featured on shows like Family Life Today, Stand to Reason, Breakpoint, WAY-FM (Mornings with Brant), Frank Pastore, The Janet Mefferd Show, and Apologetics 315. I'm the author/artist and I want to review Has the Biblical Text Been Corrupted over the Centuries? / Adapted - eBook.